Habitat Restoration and Management: the Power of Volunteering! The current phase of WCAMP’s Oregon Spotted Frog Project (see below) involves restoring and enhancing key Oregon Spotted Frog (OSF) breeding and tadpole rearing habitats at the Whatcom Land Trust’s Samish River Preserve. Project results indicate that the number of frogs in our study population is declining, particularly in one area (“Southeast Meadow”), where more than half of the frogs breed each year. This decline is evidently related to changes in habitat, exacerbated by dry weather conditions in recent years. The culprit is reed canary-grass, an invasive, tall, densely-growing, wetland grass, which gradually degrades or eliminates sites suitable for egg laying and causes premature drying in aquatic habitats necessary for the survival of tadpoles and young-of-year frogs. In order to reverse this population decline, we have developed and are implementing a multi-year habitat plan for Southeast Meadow. The plan combines habitat restoration and enhancement. Habitat restoration represents long-term improvements in habitat, primarily by creating deeper pools than would otherwise exist to be used by all Oregon Spotted Frog life stages, but particularly as tadpole habitat. We create these pools by breaking through and removing sections of a floating rooted mat of reed canary-grass that covers water more than two-feet deep. Much like a “quaking bog,” the rooted reed canary-grass is a layer of roots and muck that floats at or near the surface of the water, denying access to the aquatic habitat underneath. We have now completed three new pools – one each year – and the first of these (created in Sept-Oct 2016) has been successfully used by Oregon Spotted Frog tadpoles for the past two years. We are hoping that some of the frogs from the 2017 year class will be returning to breed for the first time in 2019 and 2020. Habitat enhancement represents shorter-term improvements in habitat, particularly mowing the reed canary-grass in late summer and autumn to prevent thatch build-up and creating open, shallow water areas where Oregon Spotted Frogs can lay their eggs in early spring the following year. We also make pathways for tadpole dispersal. These habitat changes are temporary — much like mowing your lawn does not have a lasting effect. Eventually the reed canary-grass again grows tall and dense, but not before the frogs have benefited from the changes. 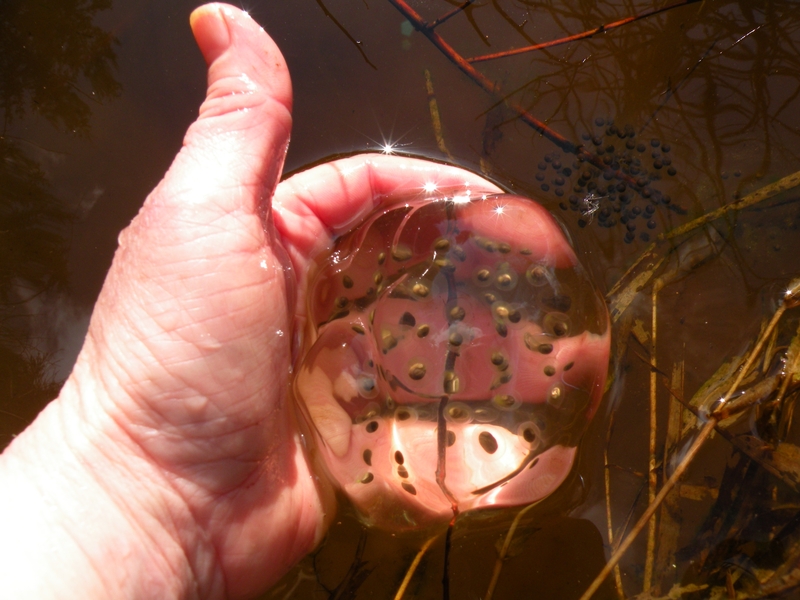 Critically, our plans are guided by site-specific data from: (1) water depth monitoring performed since 2016, (2) Oregon Spotted Frog egg mass surveys that we have led since 2013, (3) studies of tadpole growth, development, and abundance at different sites used by Oregon Spotted Frog in 2014, 2016, and 2017, and (4) vegetation monitoring within our habitat work area at Southeast Meadow. Going forward, we will continue to collect these data, and test whether our efforts have been effective and can be sustained. We will also continue to share our methods and results with other scientists and land-managers to conserve the Oregon Spotted Frog and move the species toward recovery. Populations of OSF were first discovered in Whatcom and Skagit Counties in 2011 as a result of survey work performed by the Washington Department of Fish and Wildlife and volunteers. Surveys were conducted on private lands (with landholder permission) in the South Fork of the Nooksack River and the headwater region of the Samish River. Egg mass surveys in the first year resulted in the tentative detections of a number of occupied sites, which were subsequently confirmed in 2012 when adult frogs, egg masses, and larvae were all observed. A population has also been discovered in the Sumas River drainage. The OSF population at the Samish River Preserve is the only population which has been surveyed each year since 2012. Originally found from the Lower Fraser Valley of British Columbia to northeastern California, the OSF is believed to have disappeared from large portions of its former range. The species has been listed as State Endangered since 1997 and federally Threatened under the Endangered Species Act since August 2014. The USFWS is currently working on the federal Species Recovery Plan for OSF. The OSF is highly aquatic, requiring sites with permanent water, but breeding in areas of shallow water, which may dry seasonally. Egg-laying sites tend to be open and sunny, with sparse, low vegetation when the frogs are breeding. The ability of hatchlings to move from areas that do not hold water for a sufficient period for larval development (3-4 months) to more persistently wet areas is crucial to their survival. The quality of egg-laying and tadpole rearing habitats is degraded in areas where the common, invasive reed canary-grass predominates. Unfortunately for the frogs, all known OSF sites in Washington are affected by reed canary-grass, which thrives in shallow, wet areas and can reach heights of more than 6 feet, excluding other vegetation, and creating a thick layer of submerged thatch. Do OSF eggs and larvae perform equally well in each area (i.e., comparing number and survival of egg masses to hatching; developmental rates, growth, time to metamorphosis, and relative abundance of larvae)? What predators occur in each area? What habitats are larvae actually using in each area and how far do they disperse from egg masses after hatching? Are any of the areas “sink” habitats (i.e., habitats where few or no tadpoles survive to metamorphosis)? Could any of these areas be improved with management? Our results in 2014 provided evidence that conditions for OSF tadpoles were least favorable for growth and development at Southeast Meadow, where more than half of the population typically breeds. Tadpoles grew and developed faster at the ponds; however, the ponds supported predators that did not occur in the meadows, including Giant Water Bug and Brown Water Scorpion. 2015: In 2015, the OSF population at the Samish River Preserve endured drought conditions and an unusually warm summer. Although eggs in most of the 298 documented egg masses hatched, Southeast Meadow (where there were 159 egg masses) was completely dry by June 15, much too early for any tadpoles to have reached metamorphosis. This early drying was probably hastened by the advanced stage of reed canary-grass invasion into deeper water areas that might have otherwise provided tadpole habitat. A similar pattern occurred elsewhere, with North Meadow (15 egg masses) drying on June 28 and Southwest Meadow (21 egg masses) on July 29. If any tadpoles survived to metamorphosis in these areas, the metamorphosed young-of-year would still have had to travel in dry conditions through dense reed canary-grass to reach permanent aquatic habitats after the last pools dried. The fate of tadpoles at the ponds in 2015 is unknown. Metamorphosed young-of-year OSF were not observed, suggesting that survival was lower than in 2014, possibly due to predation. Nevertheless, the drought illustrated the importance of the ponds in providing summer habitat for adult OSF, when other areas were dry. However, more information is needed regarding seasonal movements within this OSF population and adequacy of aquatic connections to allow the frogs to move between sites, particularly in late summer. Evaluation of characteristics to differentiate larvae of Oregon Spotted Frog and Northern Red-legged Frog. Click on this link to view a fresh clutch of Oregon Spotted Frog in Whatcom County. Listen carefully and you can here their distinctive “knock, knock, knock” call (turn up volume to max). Thank you, Stephen Nyman, for sharing this video. Click on the link below to watch a video on the status of the Oregon Spotted Frog in the Fraser Valley, BC. Chris Brown (WCAMP volunteer) took this video of a large congregation of Oregon Spotted Frog egg masses. This was shot in mid March 2014. Get the latest information on the status and management recommendations for the Oregon Spotted Frog. The new Draft Washington State Oregon Spotted Frog Recovery Plan and the results of WDFW surveys for Oregon Spotted frogs in Skagit and Whatcom Counties are out. Click on the files below to read documents.